Frank summarizes and critiques the sixth issue of the "DC You" Martian Manhunter series by Rob Williams and Eddy Barrows, plus we catch up on a backlog of mail. While the Manhunter from Mars is often treated as a derivative and minor character in the pantheon of notable comic book heroes, one aspect of his backstory is fairly unique amidst the legions of super-heroes who are orphaned or have no family to speak of. While I had a number of art jams going to showcase for the 60th anniversary of the Sleuth from Outer Space featuring fellow heroes, villains, and supporting players, the most obvious way to honor J'Onn J'Onzz was to devote the most effort and resources to a family picture. In the earliest stories about the character, his whole and living parents were introduced, with a younger (relatively) teenage brother showing up a few years after. All three turned up occasionally throughout the Silver Age in a peaceful domestic setting. Until 1969, Mars was a vibrant, healthy environment, in sharp relief to the usual trauma and loss surrounding other long underwear types. Even after the destruction of Mars, J'onn J'onzz spent nearly two decades shepherding the survivors and foregoing the adventurer's life. Just a few years after returning to the Justice League, a new retroactive history was given to the Martian that made him a widower and father to a deceased daughter. This new status quo came to define J'Onn for the rest of his career, and more than virtually any other character excepting Mr. Fantastic, J'Onn J'Onzz is the consummate "family man" of comics... even in the absence of blood relatives, through his memories and human surrogates for those he's lost. Younger brother T'omm was introduced in 1961, and was the character who initiated the jam in pencil form. An initially unnamed spouse eventually dubbed M'yri'ah came out of the 1988 Martian Manhunter mini-series, and was the first inked & colored figure in the piece. 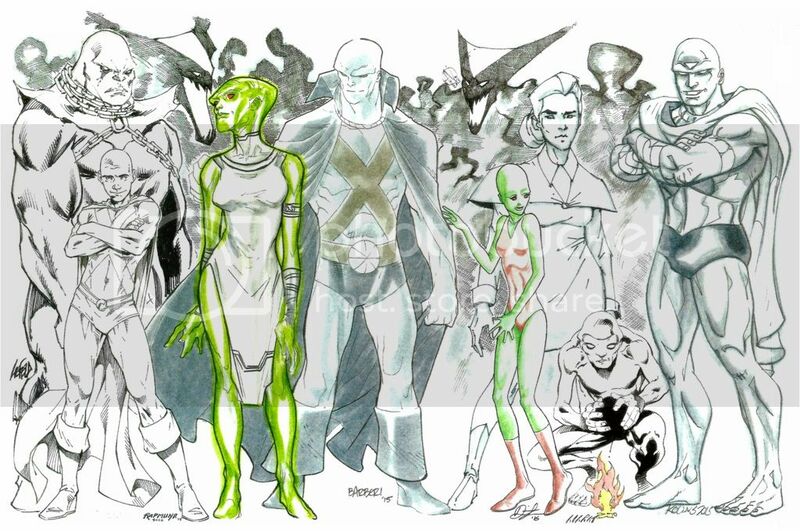 Our hero J'Onn was third and closest to the center, tasking the artist to heavily incorporate him into the previous two drawings (note the hand on his wife's shoulder & cape flowing behind bro.) Daughter K'hym shared publication history with her mother, is the only character in the jam who was fully colored, and the artist successfully integrates her into what had appeared to be a closed loop between the initial trio. This was the core of the family to me, so there was greater flexibility with the rest of the piece. Besides blood relatives, I also wanted to add a religious aspect to the family portrait through the most famous Martian deity and the one with the greatest impact, H'ronmeer. This deity became associated by name with the plague that retroactively wiped out the Martian race from 1988 until relatively recently, though generally being treated as benevolent overall. I thought this being might show up around Malefic or J'Onn's grandmother, since they had closest ties. I also thought a painter might contrast well against the firmer lines of the other figures, but that angle didn't pan out. Instead, I went with Adrian Nelson, who I knew I could rely on to deliver quality work after his previous efforts on Bloodwynd, Malefic, and a third piece I haven't posted yet. He added graytones to fill in background areas and specifically to flesh out Sha'sheen so that she'd feel more of a piece with the rest of the figures. More importantly, his ominous and intricately crosshatched H'ronmeer(s) not only tie the entire jam together, but also allude to the duality of perception about the character (creative & destructive fire from the heart of the Red Planet.) Nelson did a fantastic job making this work feel complete!